The RISE-X Pro is the latest adjustable standing desk, introduced by TechOrbits. It has a modern and sleek outlook, with multiple platforms for putting your monitor, keyboard, mouse, speakers and other accessories on. TechOrbits designed the RISE-X Pro to ensure that the user will get maximum comfort and convenience while working long hours in the office. The desk comes unassembled, but putting it together is very easy and in the box you get a screw driver and all the pieces you need. If you feel confused during the setting up process, you should refer to the very clear instruction manual in the box. The desk is a convertible, which means that it can go from an ordinary office desk in to a standing working station. So, whenever you feel like sitting and doing your tasks, you can keep the desk in its normal mode, but when you feel tired by sitting with the same posture, you can quickly turn the desk in to a standing one. The adjustment happens due to the presence of gas springs, which can elevate the platform’s height to a maximum of twenty inches, from its original mode. Moreover, there are pre-drilled monitor mount hole for any standard thru-mount arm, which extends RISE-X’s capabilities significantly. 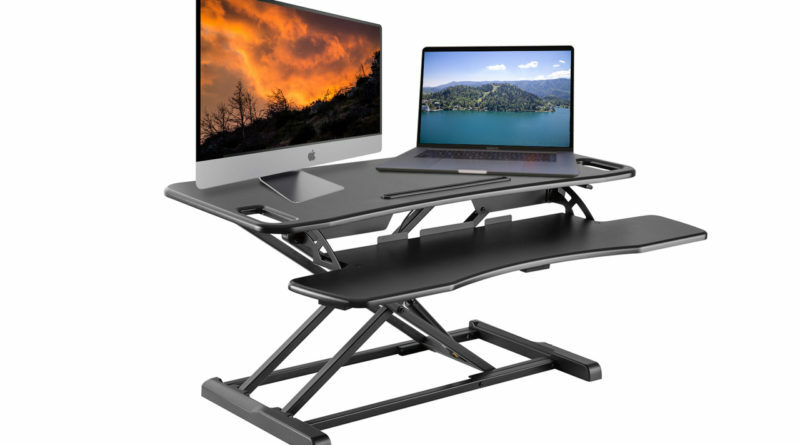 RISE-X Pro can handle up to thirty three pounds of weight and has a large surface area to keep all your electronics, notebooks and more in one place. The desk has dimensions of 37.2 x 15.7 (width x depth), with ample room to make sure that the platform is never crowded, even if you are using multiple display screens. The non-skid silicon pads on the base allow you to work on RISE-X without any fears of the desk sliding away from your reach or getting any scratches when it hits any surface. One notable feature of the desk is the slot in the front of the desktop area. This allows for tablets, phones, pens, pencils, etc to be placed right up front. This is very useful to keep these items right at hand. Besides my phone, I found pen storage to be the next best use for this slot. RISE-X comes with a free return policy and three years of warranty for any manufacturing defects. It is important to know how to adjust the standing desk to suit your height and body type. Usually, people who are using a standing desk are already aware of the optimum adjustments for themselves, but if you are using the standing desk for the first time, you should better take out some time and understand what you are supposed to do. If you would like to learn more about switching to standing check out our Making The Switch articles.